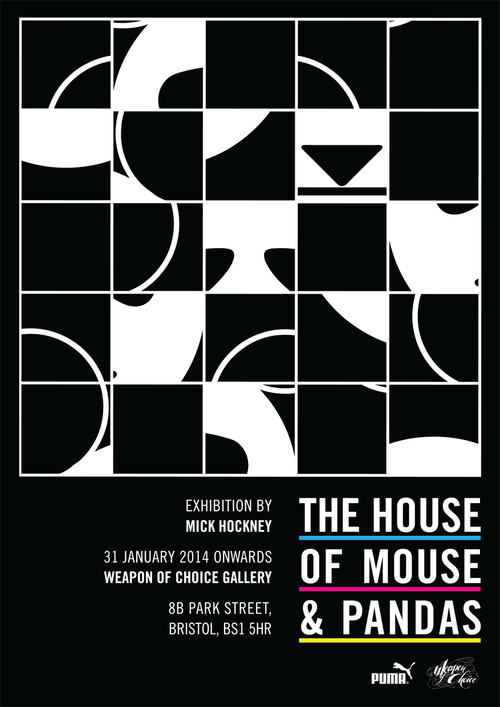 Mick Hockney’s The House Of Mouse & Pandas is his second solo show at Bristol’s aptly named Weapon Of Choice Gallery. If you are familiar with Bristol’s Weapon of Choice gallery you’ll probably be familiar with the irreverent, darkly humorous and politically charged images of Mick Hockney. 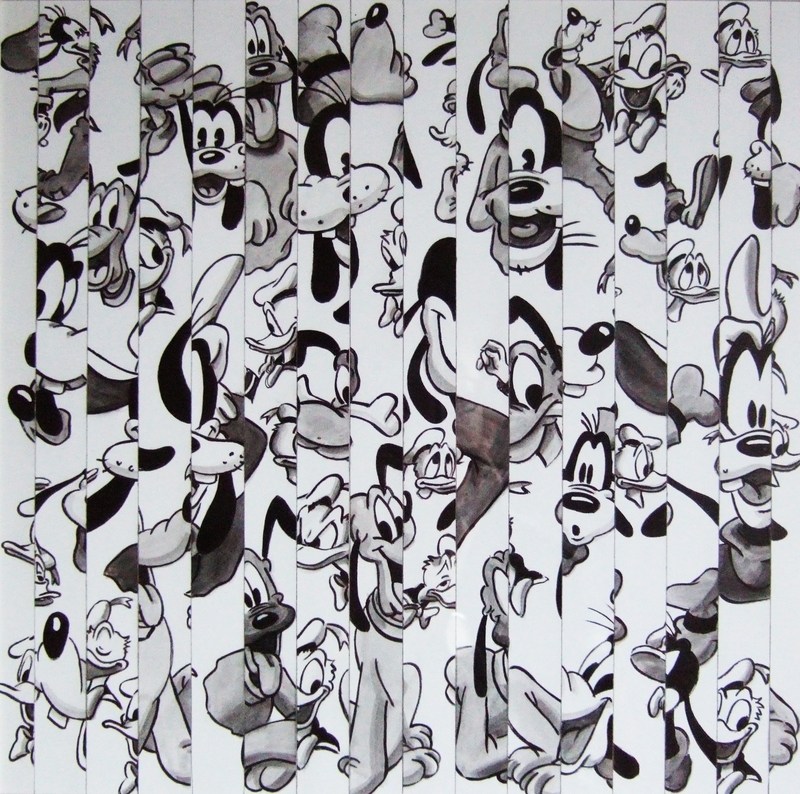 His first solo show at WOC was back in 2010 and during their group show his work – which targeted branding, fascism and eco-issues – sat happily alongside other artists like Inkie, Andy Council, Acer 1, Sepr et al. Something of an elder statesman in the Weapon Of Choice crew, Mick is easily identifiable by his Wild Bill Hickok moustache and a penchant for classic 50’s western shirts and American classic workwear. I’ve known Mick since the dawn of the Seventies when he arrived at the College of Art & Design in Cheltenham with a Bowie/Mick Ronson haircut fresh from the Isle of Wight Festival. After notching up a first class honours in sculpture Mick’s casting and model making skills led him to work at the Welsh National Opera and Madame Tussaud’s but it was his stint at Spitting Images during the turbulent Eighties that was to hone his feisty and witty political over view. Working with Fluck and Law during the height of Thatcher era was a massive buzz. From there to Nick Park’s Aardman animation empire in Bristol was but a short step but his role as Union shop steward during the making of ‘Chicken Run’ and ‘Wallace and Gromit: Curse of The Were-Rabbit’ was guaranteed to be potentially volatile. Mick has always got a visual project on the go and it’s music along with the radio – cricket commentary etc – that generally provides the audio backcloth. Having DJ’d a good few house parties with Mick I can attest to his excellent and eclectic taste and while he has honed his vinyl collection down in recent times he continues to add new music to the stack of tunes in his kitchen. 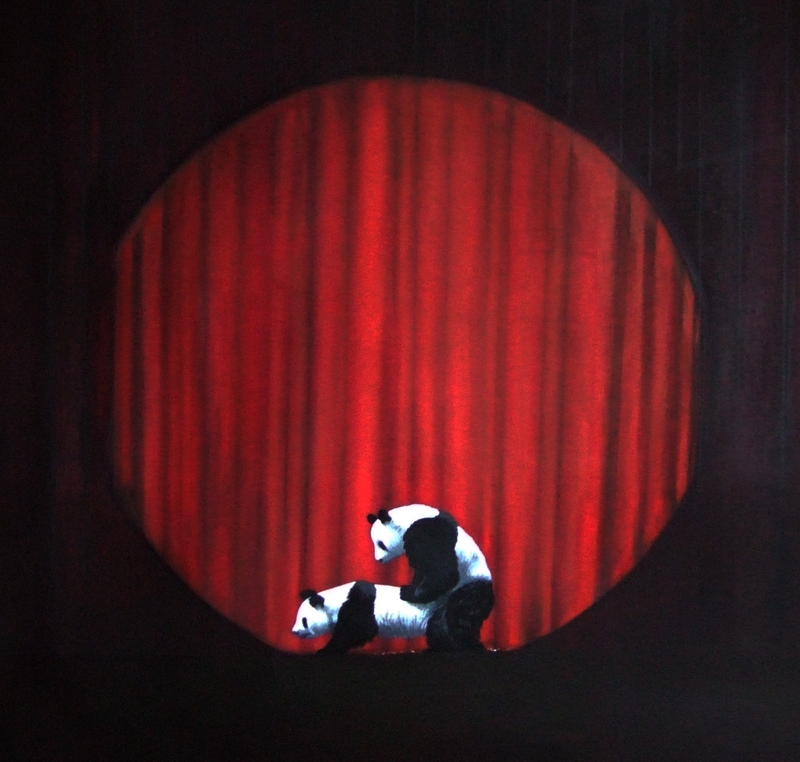 Living in Bristol he is attuned to the world of street art and enthusiastic about the work of other contemporary artists like Stanley Donwood. Mick is a craftsman and not surprisingly a devotee of the “outsider art” bible, Raw Vision. I can definitely envision him enthusing about an artist like Lonnie Holley whose visual pieces come to life to the sound of his singing and the rhythms of making. I’ll definitely check the show before it finishes. 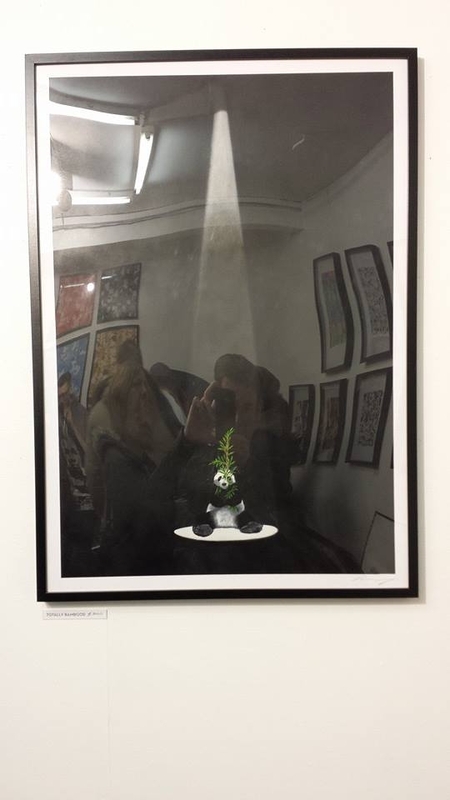 If you are in the Bristol area… pop into Weapon Of Choice and snap up a Hockney. Support your local visionaries! 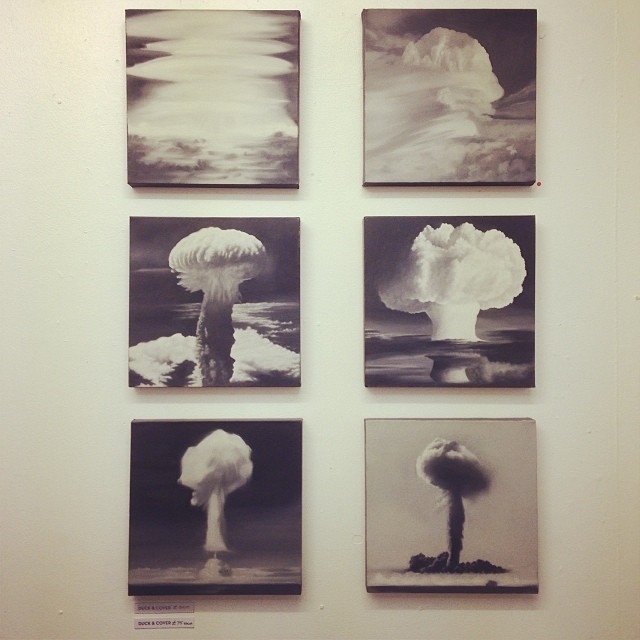 This entry was posted in Art, Just Runnings and tagged anti nukes, Bristol, Disney, Inkie, Mick Hockney, painting, Sculpture, Spitting Image, Stanley Donwood, Street Art, The House Of Mouse & Pandas, Weapon Of Choice Gallery. Bookmark the permalink. looks like a really interesting show- trying to commission Rico to get me a piece. hope they come with soundtracks. Yay Ann – excellent idea !